The Nintendo Wii has revolutionized the computer gaming industry and while there are not a plethora of Wii hunting games available to play on this amazing new video game console, you will be able to find something to satisfy your outdoor nature while playing inside. One of the best parts of the Wii is that it provides a certain amount of movement necessary to play the game, so when you play, you may find that the experience is much like the real thing only in your own home! One of the most popular and exciting Wii hunting games that players are all talking about is called hooked. It comes with a miniaturized fishing rod that you replace the Wii hand controllers with. Then you have some real hunting action. After all, even when you’re fishing, you’re hunting, so you may be quite surprised at the fun you can have with “Hooked”. Hooked is the only Wii hunting game on the video game console with online multi-player capabilities. You can challenge the best virtual fishermen around the world via the online Wi-Fi play available only with Wii. 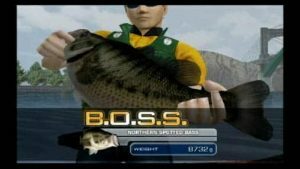 You can immerse yourself in the fight with realistic fishing and working up a sweat as you lean your Wii remote in every possible direction all the while reeling in the rod like crazy just to catch the big one. It is as if you actually have a rod and reel right in your own hands. 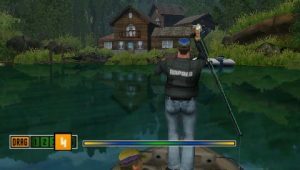 There is a wide range of fishing environments to choose from with this game including six photo realistic lakes to a meteorite crater turned lake to a man-made recreational reservoir. There are three exciting single-player game play modes as well. You can hone your skills in practice or time attack mode. Then you can move on to tournament mode to see if you can become the next world champion! Hooked retails for about $59.99 and often comes with a free controller to gaming enthusiasts. Another one of the Wii hunting games available for play is called Rapala Trophies which is also a fishing game. The best part about this game is that it offers up the choice to catch a variety of fish including brown trout, lake trout, king mackerel and nile perch that are usually found only in the world’s hottest fishing spots. Travel from the Kanai River in Alaska to Lake Okeechobee in Florida to Lake Victoria in Africa as you play through 16 game play levels based on authentic locations around the globe. Since the Wii is a relatively new video game console, we are sure that there will be plenty more games available for sale in the not too distant future. For now, though, be sure to check out the Wii hunting games that are available now – Hooked and Rapala Trophies.